On some streets, getting drivers to stop speeding might be as easy as eliminating a few stripes. That’s the finding from a new study from Transport for London [PDF]. The experiment was performed last year on three 30 mph roads that had just been resurfaced, where center lines were not repainted. A fourth street was resurfaced and had its center lines painted back to serve as a control. Researchers found that drivers slowed down on all the three streets without center lines. On Seven Sisters Road, for example, after the resurfacing, northbound speeds dropped 2.5 mph and southbound speeds fell 4.1 mph. Those changes appear to understate the impact of removing the center lines. When TfL observed traffic on the control street, motorist speeds had increased an average of 4.5 mph. Apparently, the smoother road surface encouraged drivers to pick up the speed, making the reductions on the three other streets more impressive. A theory is that centre lines and hatching can provide a psychological sense of confidence to drivers that no vehicles will encroach on ‘their’ side of the road. There can also be a tendency for some drivers to position their vehicles close to a white line regardless of the traffic conditions, believing it is their ‘right’ to be in this position. Centre line removal introduces an element of uncertainty which is reflected in lower speeds. When it comes to center lines, TfL notes, “most traffic engineers prescribe them by default without questioning the necessity.” London appears to be reevaluating this assumption after a 2009 directive from Mayor Boris Johnson to eliminate as much clutter from the roadways as possible. I’m curious what other factors this changes. Does that come at the expense of some increased percentage chance of someone assuming it’s a one-way road, and having a head-on collision? Does the overall balance reduce collisions, or just shift it from speed related to head on? This is the dumbest way to slow motorized traffic I have seen. It reduces the roads’ capacity to carry cars, because responsible drivers won’t know whether there are one or several lanes to occupy. One column of cars bunched every which way will take up unnecessary amounts of space. Sure, drivers slow down, but confusion, territoriality, and nervousness reign in place of rational apportionment of road space. Just as it is better to designate separated bike lanes and sidewalks, so too is it good to designate lanes for motorized traffic: each user inhabits a space and that space is usually respected by other users. If you want to slow down city traffic on major and minor roads, and I agree that is a positive thing, do it in a way that rewards rational, calm, prudent driving. The methods employed in this London experiment are regressive, harkening more to pre-War driving by herd, than good, modern engineering. I don’t know how well this would work on arterials, but on 9th Street in Berkeley, one of the neighborhood bike boulevards, a repaved section similarly had the center line removed. In my experience drivers now pass bicyclists with a much wider buffer on this section than they do on the other parts of 9th Street that still have a center line. Kirkham St in SF had no markings whatsoever until bike lanes were installed a few years ago. The bike lane stripings were added, but no center lines. We’ve noticed that people now drive a lot slower given both directions of traffic share a single ~20 ft lane. Perhaps not on arterials, but smaller streets sure. See SF’s Kirkham St example (above comment). Also – again talking about small streets here – any stripings (a dashed yellow line, say) signal to people that this is a movement corridor. Naked streets are more ambiguous and thus more available to other uses. Consider some narrow residential streets (there are many in the Bay Area) which may not need that dashed yellow center line – there are quite a few in my neighborhood. There’s nothing dumb at all about proposing an experiment, collecting data, and presenting the results. Sounds like a far more enlightened way to run a transportation agency than most in the US can manage. And personally, I fail to be surprised at the results. I’ll tell you what’s dumb–traffic engineers here are still trying to put medians on roads every time they’re repaved, thinking somehow making a street prettier calms it. In fact, we know it’s the opposite–medians encourage speeding. Oh, and re your criticism about how removing the center lane “reduces the roads’ capacity to carry cars”–uh, what’s your point? You’re telling us you’re still a proponent of LOS being the most important measure of how well a road ‘works?’ That backwards way of thinking either never took hold in the UK or has since been discarded, fortunately. Also, you are really wrong thinking that a road always needs to be segregated by mode type. In most countries of the world the safest road of all is the country lane or urban alley in which all types of traffic mix–pedestrians, bikes (motorized and not), cattle, and the occasional car. Car drivers know that they are ‘guests’ on roads of this type and behave accordingly. I’m not sure if this particular road in London will ever fall in this category but if the speed of traffic is downgraded enough it at least makes sharrows reasonable. I hope someone with the SFMTA will consider collecting data on that! It was just repaved. We’ll see how they put it back. It really depends on the context. Small roads can do very well with different modes intermixed. The Berkeley street I referred to can be viewed at the link below. South of here it is a shared lane but with a dashed center line. North of here there is a solid center line and narrow bike lanes. To me, the middle area with shared lanes and no center lines is the most comfortable to bike, and the area with the narrow bike lanes the least comfortable, ironically (The 45 degree view still shows the old lane configuration, by the way, so you have to turn that off). I’ve seen it happen on many streets in SF, and I think it’s been done intentionally, even. But no one studied it. 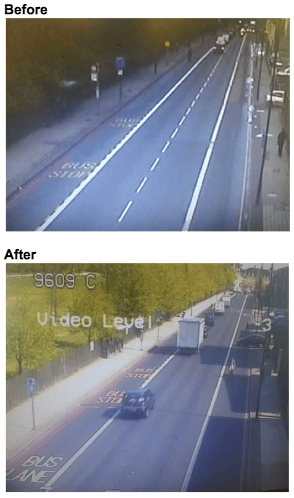 If all the roads in question are the same as in the pictures (which is implied), then there is not reduction in capacity because no lanes were removed. I am also curious about this. Centerlines were invented to reduce head-on crashes and had a dramatic effect on them. They do increase speed, however. Removing lines adds just enough uncertainty that users have to use judgment in sharing the space. Washington DC addresses the one-way/two-way question by putting a very short double yellow stripe on narrow two-way streets at each intersection. It works well and drivers slow down (it also helps that there are mainly stop signs rather than traffic lights on small streets). As a traffic engineer, I have recommended removing center lines on local streets to a city planning bike lanes. Good engineering tries to understand how people think and act and uses it to its advantage. Removing the center line reduces certainty and creates friction in car movements. Though friction is not wanted on through roads where capacity and speed are worthy objectives, neither capacity nor speed are objectives on residential streets, in fact, they are things we do not want. Friction for car movements is what you want to create to calm traffic and get streets that are safer for all users. When you create lanes for cars, you are telling drivers “this is your lane, no one else has the right to travel in it”. The result is that people do not pay attention to other users, they feel they just need to stick to their lane and all will be fine. So they go faster and pay less attention around them, following the lines. They will honk and get angry if anyone “intrudes” on “their” lane. When you get rid of the lanes, they realize that other users will share the same space as them, so they are more careful of other users and more aware of their surroundings, and they will slow down to give them time to look around and react to other users. They will also have no problem giving wider berths to cyclists, some car drivers, in the presence of lines, consider these lines to be walls and will not intrude on them, driving closer to cyclists and parked cars than they would otherwise. This obsession with ensuring speed and capacity of vehicular movements in all situations is just plain stupid. Streets are not highways and shouldn’t be designed as such. The question is how drivers actually use the road – if even 5% of drivers drive where the center line used to be, that could easily cut the road to effectively a single lane most of the time. So it depends on how drivers actually behave, and how much traffic the road usually gets. Some people may drive near the center of the road when they are alone, but when another vehicle is traveling in the other direction, they will scoot over to the right side of the street to let the other pass. They’re not going to play chicken. There are plenty of streets in both suburbs and cities which allow travel in both directions and have no center line, nor any line for that matter. There are also gravel roads in rural areas which have no center line for obvious reasons. People are smart enough to know to keep to the right when passing another vehicle coming in the other direction. This has been intentionally tried and studied in San Francisco, and the speed decreases were much smaller than expected, even when opposing travel lanes were less than 10′ wide each. Never mind – I was confused. Because of the picture with no cars in the right lane, I forgot that this was the UK, where people drive on the left, so I thought the two lanes here with no divider were going in the same direction. Two lanes in the same direction with no divider can easily merge. But when we’re talking about opposite direction lanes, people figure that out. No capacity will be lost, except due to slight slowing down, which is only marginal, rather than halving capacity as two adjacent lanes merging would do. “people figure that out” works nearly all of the time. It’s the few exceptions that result in a head-on collision which not-uncommonly can kill 3-4 if not more people. I don’t disagree that it might lower speeds, but I’d want to see more analysis before calling this a success. “invented to reduce head-on crashes and had a dramatic effect on them” … can you cite stats? Because in many countries, they are rare, and people tend to drive quite fast on, say, narrow British country roads. I suspect we’re just bad/inattentive drivers here. According to FHWA, centerlines can be expected to reduce crashes by 33%. This will vary depending on the road or street and the types of crashes occurring there. They reduce “lane departure” (head-on and run-off-road) crashes more than intersection crashes for example. A fairly straight, low speed street might be a good candidate for this. A higher speed, curvy rural highway would not. Mike, do you have more info about this research from SF? Any links or dates?